I haven't been giving my art enough room to breathe lately but maybe I'm finding my way back. . .
My early years as an artist focused on portraiture. It was the majority of my work in my twenties, thirties and early forties. Then, I began composing my own pieces, usually involving people doing their own thing, and fitting them in between commissioned portraiture. Gradually, I drifted to more and more of my own compositions. Images of people making and enjoying music became my first subject choice. New Orleans and the Blues Highway provided (and continues to provide) me with volumes of interesting images to paint. Most of my photo references contain the stories of music making, the raw materials for making portraits that are not so much of individual people as they are of music making itself. I still love to paint people enjoying music, and I think I always will. 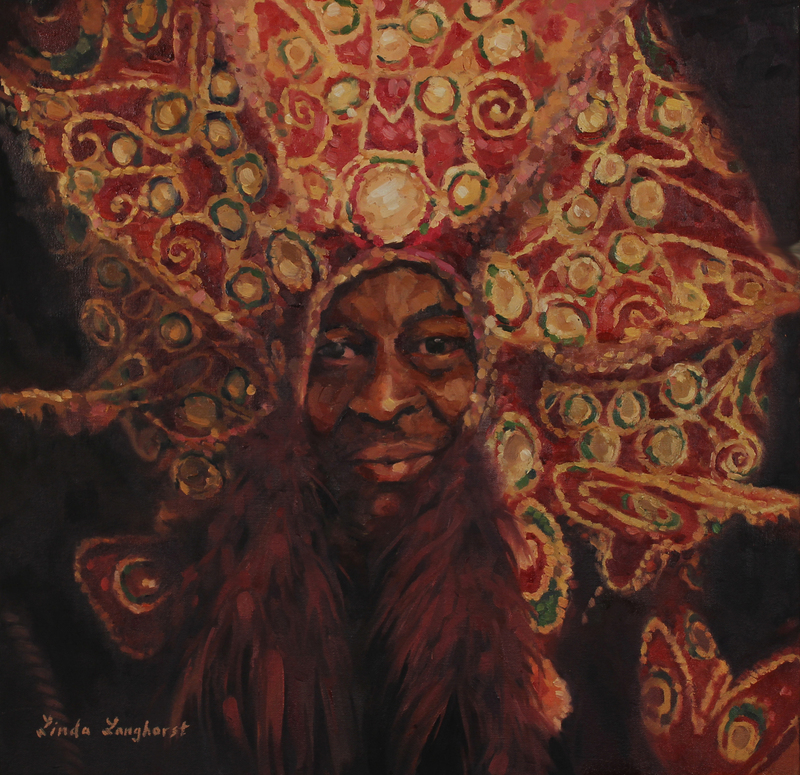 But on a recent trip to NOLA, John and I had the pleasure of meeting a Mardi Gras Indian Chief whose stunning presence awakened my desire to paint portraits again. I knew imediatly that I wanted to paint him and just how I would design the piece. And from that first piece (I'll post soon), I decided to paint more portraits- in the same format as my Mardi Gras Cheif. I've committed myself to a series of portraits of people whose appearance strikes me as interesting. And I've decided to paint them on my own terms. What that means is: each of these pieces are my personal concoctions. I'm painting some feature about them that I think is notable. And I'm experimenting with how to apply paint and design a fixed sized canvas to best tell the story I'd like to tell. I have been away from portraiture for so very long, it is a little scary. But it is also incredibly freeing. No one is asking me to paint these images. I am asking for permission, but taking no requests on specifics. These portraits, unlike most portraits are truly "On My Own Terms". And I am loving it. So far, I have four pieces painted. I'll photograph them and post them soon. I don't know where the series will be shown. I'm not painting them with financial concerns in mind. I'm painting the best pieces I can muster up, and trusting that at 58 years old, that makes the most sense right now. My friend Tany Huang helped me get a print of Chief Charles to him. He likes it!! This makes my job FUN! Sorry. I can't figure out how to rotate this image. . .